PROVERBS 3:35 KJV "The wise shall inherit glory: but shame shall be the promotion of fools." 32For the froward is abomination to the LORD: but his secret is with the righteous. 33The curse of the LORD is in the house of the wicked: but he blesseth the habitation of the just. 34Surely he scorneth the scorners: but he giveth grace unto the lowly. 35The wise shall inherit glory: but shame shall be the promotion of fools. The wise shall inherite glory, but shame shalbe the promotion of fooles. The wise will have glory for their heritage, but shame will be the reward of the foolish. 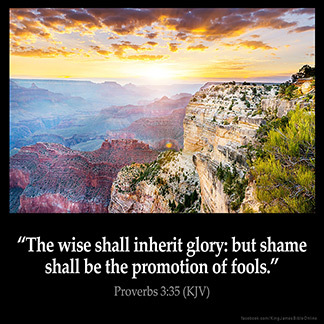 The wise will inherit glory, but shame will be the promotion of fools. The wise shall inherit honour; but as for the fools, they carry away shame. 3:35 Shame - Instead of that glory which they seek. The wise - chakkim - skillful shall inherit the glory, the of God has been tested and found to be trustworthy. Those who trusted it in times of Sodom and times of Noah so forth have a good story to tell and those who trust it now they are saved and shall be saved through our Lord Jesus Christ.